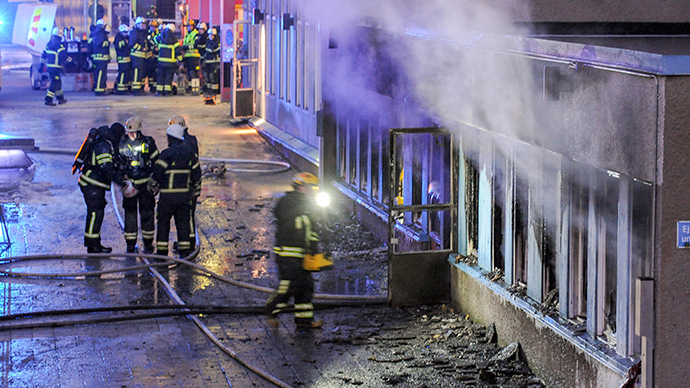 An arsonist has set a mosque ablaze in the southeastern Swedish town of Eskilstuna. The Christmas Day attack comes amidst heightened anti-immigration sentiment in the country. Up to 20 people, including children, were in the mosque at the time of the attack, which occurred in a residential area of the medium-sized town on Thursday. The fire erupted after 1 p.m. local time, in a prayer room which was housed on the ground floor of a tower block, after an attacker threw an incendiary device through the window. The space was reportedly used by the city’s Somali association. "A witness saw somebody throw an object through the window of the building, which serves as a mosque, after which a violent fire began," Lars Franzell, who is heading up the arson investigation, told Reuters. Five people were later rushed to hospital for injuries ranging from cuts to smoke inhalation. "Two suffer from smoke inhalation, two have cuts and bruises and one has a fracture,” Franzell told Sweden’s TT national wire service. One person was seriously injured but is in stable condition. The attack on the mosque is likely to intensify tensions over immigration in the country. According to figures for 2013, Sweden is by far the largest recipient of asylum seekers in the 34-member Organization for Economic Co-operation and Development (OECD). The Nordic country took in 5,700 asylum seekers for every million residents last year – more than double that of any other OECD country. People from Eritrea, Somalia, and Syria are the top three nationalities to apply for asylum in Sweden. "@theKhalude: A mosque in Sweden which has been set on fire today. It seems everyday it is getting worse in #Europepic.twitter.com/J6PB0LiDlJ"
The asylum policy has become an increasingly contentious issue for the nation of roughly 9.6 million people. While Sweden’s far-right wants to cut the number of refugees coming into the country by 90 percent, mainstream parties are fighting to preserve the country’s liberal asylum policy.